We offer in house blood work, so you can have your results the same day. Our digital xray unit provides images that we can show you in the room at the time of your visit! All of our blood work/radiographs/history is linked and accessible anywhere in the hospital at all times. Should your pet need further diagnostics, we will refer you to the appropriate facility here in Richmond. We are equipped to perform all types of surgery and dental procedures, as well. We strive to provide advanced veterinary care in a comfortable environment for both owners and their pets. Sometimes, another approach is needed, or something "more" is needed with the care of your pet. That is why Woodlake Animal Hospital also offers acupuncture, Chinese herbal medicine and nutritional consults. Many people are interested in seeking a more "natural" approach towards their own care, and would like other options for their pets as well. We at Woodlake Animal Hospital want your pet to be healthy and happy for as long as they can be, so we welcome the opportunity to provide care in whichever modality suits the pet best. We also offer Reiki and incorporate the use of Essential Oils when appropriate. Do you dread inticing your cat into his/her carrier? Do you have big dogs that generally pull you through the door at the vet clinic? Do you simply have more than one pet? If so, Woodlake Animal Hospital is happy to come to you! Wellness visits, acupuncture sessions, or even that difficult time at the end of your pet's time with you, sometimes everything goes more smoothly and easily if you and your pet are in the comfort of your own home. Please call today to schedule your home visit! Woodlake Animal Hospital operates an open hospital. We are proud of our hospital and welcome the opportunity to show it to you, so please ask for a tour the next time you are visiting with us!  Woodlake Animal Hospital accepts payment via cash, MasterCard, Visa, American Express and Discover. We also accept CareCredit www.carecredit.com So that we can continue to provide you high quality service utilizing the best medical technologies, we request that payment be made at the time services are rendered. Woodlake Animal Hospital offers 10% discounts to all our local heros, including active-duty military and our full-time Chesterfield County Fire/ EMS and Police officers.